How does a journey which begins with a degree in philosophy – and a chance conversation with a librarian – lead to a surprise move from Manchester to New York, one of the advertising industry’s foremost fellowship programmes and a career-long interest in understanding customer behaviour? Onika Simon shares her story, including awards, working with Cisco and now a new direction where she’s trying to make the most of everything she’s learned along the way. Get in touch with feedback and questions @mexfeed on Twitter or email designtalk@mobileuserexperience.com. Our next MEX dining club is in London on 5th September 2018. Get in touch if you’d like an invite – it’s a relaxed dinner talking about experience design with fellow pioneers. WPP Marketing Fellowship, which led Onika to her first agency role with J Walter Thompson in New York. Cisco Hyper Innovation Living Lab (CHILL), a project Onika was involved with, which won an Edison Award for corporation innovation. Master’s Degree in Research for Design and Innovation, by Pompeu Fabra University (UPF) and ELISAVA Barcelona School of Design and Engineering, where Onika lectured. 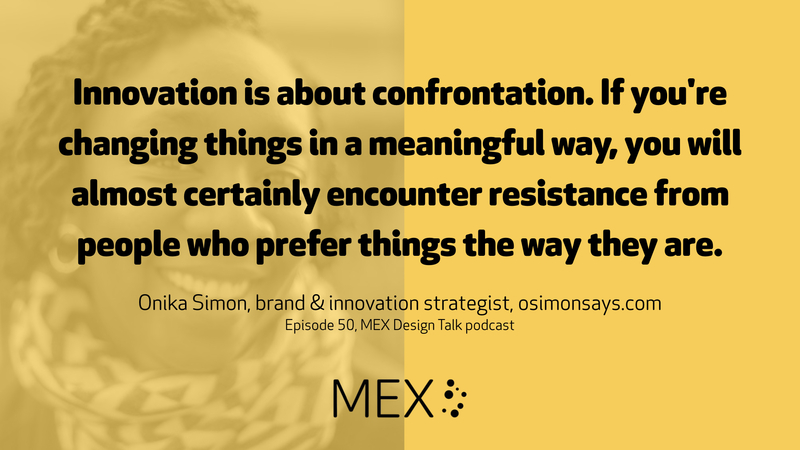 Design Talk 8: Ramona Liberoff (who kindly introduced me to Onika Simon) was a guest in episode 8 of MEX Design Talk. 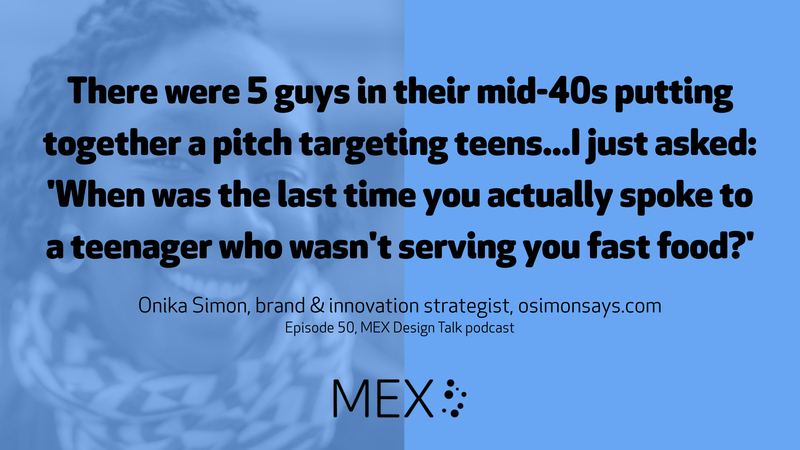 We talked about innovation’s many guises, particularly in developing markets and for people who have typically been poorly served by ‘innovation teams’ in large companies, like teenage girls in some of the world’s poorest countries. Design Talk 47: Massimo Mercuri spoke about customer-centred innovation at scale within a big corporate – AkzoNobel – in episode 47 of MEX Design Talk. Design Talk 34: Josh Shabtai talked about novel methods, including comic books, for bringing disparate parts of an organisation along on the innovation journey in episode 34 of MEX Design Talk. MEX Hidden Talents is an experimental service where you can share your dream job description – anonymously – and invite prospective employers to get in touch with job offers. We’ve already started connecting our first ‘hidden talents’ – if you’d like to find out more, contact Marek Pawlowski in confidence.